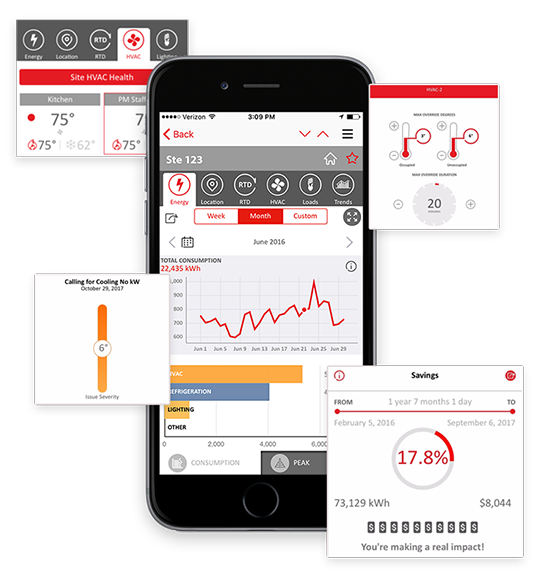 Reston, VA – December 12, 2017 GridPoint, a smart buildings technology innovator, today announced the latest release of its mobile application, GridPoint Energy Manager Mobile 3.0. This release, GridPoint’s most feature-packed to-date, is designed to make the GridPoint Smart Building platform more powerful by adding HVAC health tools, hours and HVAC schedule editing, and a savings dashboard enabling customers to do more on-the-go. The GridPoint Energy Manager platform provides visibility into facility operations to help customers automate and control sites, lower energy spend, and proactively manage day-to-day operations. GridPoint’s solution is unique because it utilizes three dimensions of data to create the most accurate picture of energy usage within a building: granular data at the equipment-level, real-time data, and historical data. GridPoint Energy Manager Mobile delivers the same intuitive and data-rich experience that GridPoint customers enjoy on their computers to iOS and Android devices. Energy and facility managers can use the application as diagnostic tools to triage HVAC or other failures at a site before dispatching a technician, to inform dispatched personnel with specific knowledge to make trips more efficient, and to validate resolutions before a technician leaves the site to reduce return trips. Mobile 3.0 delivers a more compelling solution to GridPoint’s channel partners by requiring less training and time to go-to-market. Partners may opt to leverage new white-labeling features to produce a branded, more mobile-focused experience unique to them and their customers. The release further supports channel end users or small businesses with simple bill entry tools and savings dashboards that show lifetime or monthly savings graphs to validate efforts. Enhanced functionality, including more powerful controls and insights, enable users to regulate store hours and HVAC schedules more effectively. GridPoint further extends its leadership in HVAC intelligence by introducing a new HVAC Health feature. Users can now see a history of heating or cooling issues, along with the issue’s severity, for all HVAC units at a site. To learn more about GridPoint Energy Manager Mobile 3.0, go to www.gridpoint.com/mobile.